We're always on the lookout for new opportunities. When an existing client asked us to develop a carpet tiles website we immediately did some research and found the domain carpet-tiles.uk.com was available. This is a great domain choice because it contains the keyphrase 'carpet tiles' in it. This is good for two reasons. Firstly, the search engines give more credit to domains which include keywords in them. Secondly, whenever someone provides a link to carpet-tiles.uk.com (using just the domain) it already contains the keyphrase we're optimising on. 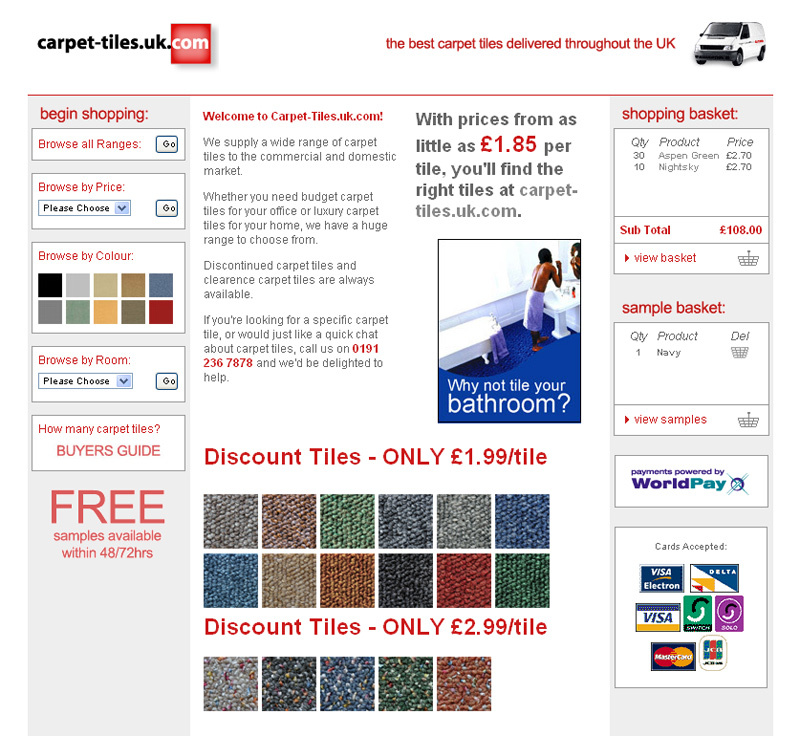 Within 6 months of launching carpet-tiles.uk.com, the website broke even on the cost of the development. This is not bad for a brand new site as it can take around 3 months for the search engines to even begin to take notice and the website was only promoted through on-site seo. We are currently working on a second version of the carpet tiles website which will bring it up to date and give a real push to the websites search engine optimisation. The site has had good rankings for the keyphrase 'carpet tiles', but this has lacked investment and it has affected sales. We are working with carpet-tiles.uk.com to really push this area to drive new business to the site. Please visit the site to find out more about buying carpet tiles.